Life, as usual, is busy. I’m learning a lot in my EMT course, which gives me peace of mind. In a previous post, I mentioned that I had signed up for a 12 week EMT training class, and I’m also looking into CERT training, which is available in a lot of jurisdictions. CERT responders are citizens who go through special training to assist in the case of a major disaster. After 9/11, and after seeing what happens when a natural disaster strikes (the 2004 tsunami, Katrina, Haiti, Chile), I decided to do something about a fact of life: bad things happen to good people in places they thought were safe. Needless to say, the 14-hour per week time commitment, plus LIFE, have interfered with a lot of the baking and cooking that I like to do. I did, however, manage to bake these Rustic Walnut Horns from one of my favorite cookbooks, Great Coffee Cakes, Sticky Buns, Muffins & More: 200 Anytime Treats and Special Sweets for Morning to Midnight. These pastries call for a versatile dough that you can whip up and freeze, to be pulled out the night before you want something freshly baked for breakfast. After you make the dough and let it rise overnight, divide it in half, freeze one half, and use the remaining half for these horns. The recipe for the dough is below, and I’ll post the rest of my adapted recipe by tomorrow, ’cause I forgot where I left my cookbook. May be in the car because, you see, sometimes I cart cookbooks with me to my EMT class. Just because. To see what others have made in their kitchens this week, be sure to check out Susan’s weekly YeastSpotting! 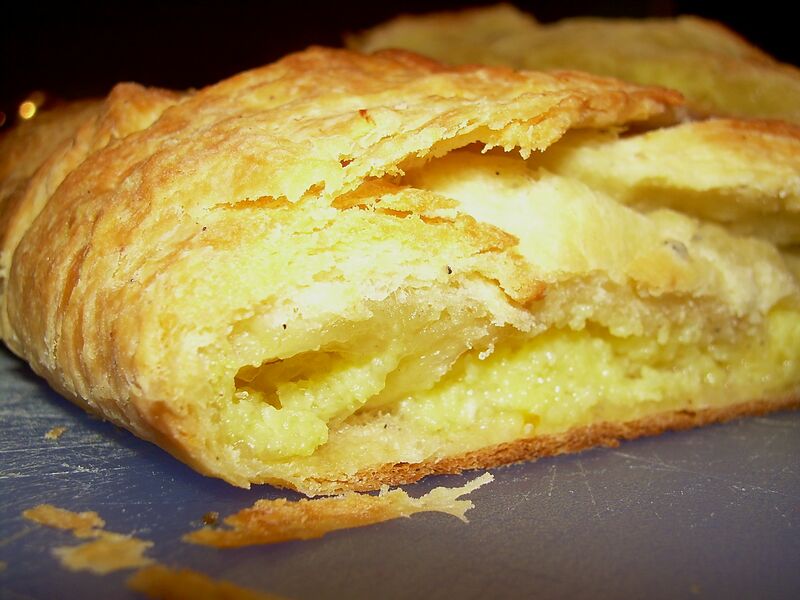 continue reading "Rustic Walnut Horns"
It’s time for true confessions: with all the baking I do, I had never before made puff pastry from scratch. 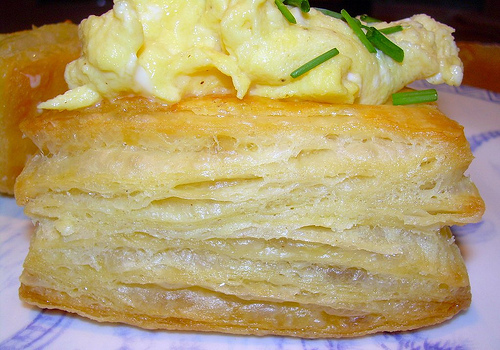 Oh, I’ve made laminated doughs for Danishes, but never just plain old puff pastry. And it had been on my to-do list for a long, long time. And that is one of the reasons I stick with the Daring Bakers (or they stick with me is more like it!) despite my hectic schedule – I get to challenge myself and bake things I’ve been putting off. So, thank you, Steph! I love your blog, and I’m so grateful that you chose this . . .
. . . because it exceeded my wildest expectations. The pastry was delicious and the rise was fantastic, much better than what I’ve been able to achieve with commercial pastry. This could be due to the fact that I used Kerrygold Irish butter, which has the consistency of a thick fudge, and a higher fat content than American butter. 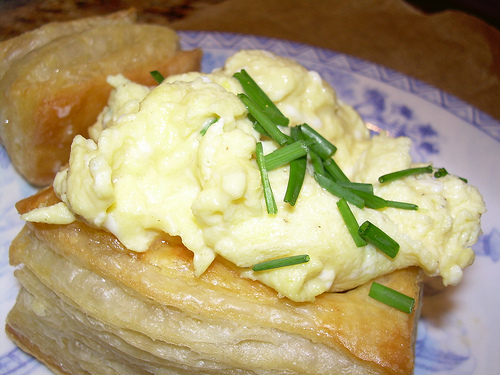 And making the puff pastry and vols-au-vent (the little cup you see in the photos) was sooooo easy. Now I’m asking myself why I waited so long! Most of all, though, it confirmed for me that my two favorite things to work with are pastry and bread. Turning and rolling out the dough, patting it like a baby’s bottom . . . very peaceful and meditative for me. Now baking cakes, not so much. Or cookies. But pastry and bread . . . .
First things first, though. I cut the salt in half because I knew it would be too salty for me (most things are). All went well in my 80 F kitchen until the fourth turn, when all the butter started to come through the dough. At that point, I thought my goose was cooked and that I would be posting about my gigantic failure. So, I popped the dough in the refrigerator overnight, then got to work the following day. I worked quickly before the butter had time to melt, and I kept putting the pastry back in the refrigerator whenever I had the faintest inkling that it was getting too soft. I decided to make square vols au vent, not because I am particularly creative, but because I couldn’t find my round pastry cutters. AND IT PUFFED! Magically, beautiful, IT PUFFED! 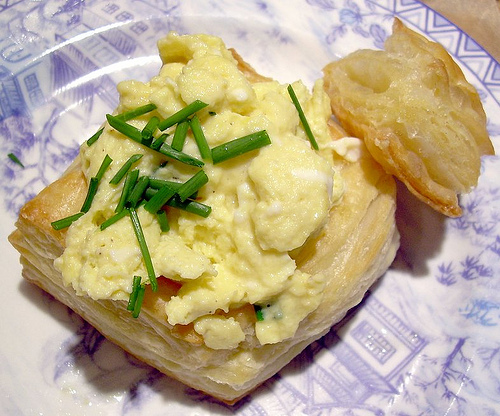 I filled the vols au vent with some soft scrambled eggs with chives which turned out to be a great choice. I loved it, my husband loved it, and Gus loved licking the plate. I’m so proud of myself. And it’s amazing how often our barriers are purely mental or emotional. One barrier down, many more to go! Recipe at this link, but check out Steph’s blog and the Daring Bakers blogroll! 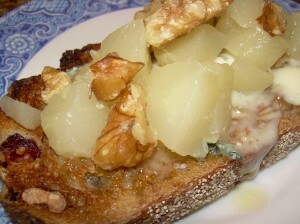 This month for Recipes to Rival, Temperance of High on the Hog and Jen of Delightful Delicacies asked us to make two out of three appetizers: Gruyere Gougères (from Thomas Keller’s The French Laundry Cookbook ), Galatoire’s Oysters en Brochette, and/or Blue Cheese, Pear and Walnut Crostini. You can find the recipes for all three, here. I opted for the gougères (French cheese puffs that are served hot), and the crostini (pics and write-up will be added tomorrow), because I do not like oysters. I’ve had some smoked oysters that were tolerable, but that’s only because the smoke hid the oyster taste, and the disgusting squishiness. How people can swallow these raw and alive is beyond me. But back to the appetizers. More after the jump . . . .
continue reading "Recipes to Rival Serves Up Some Appetizers"
If you like Nutella (are there people who don’t? 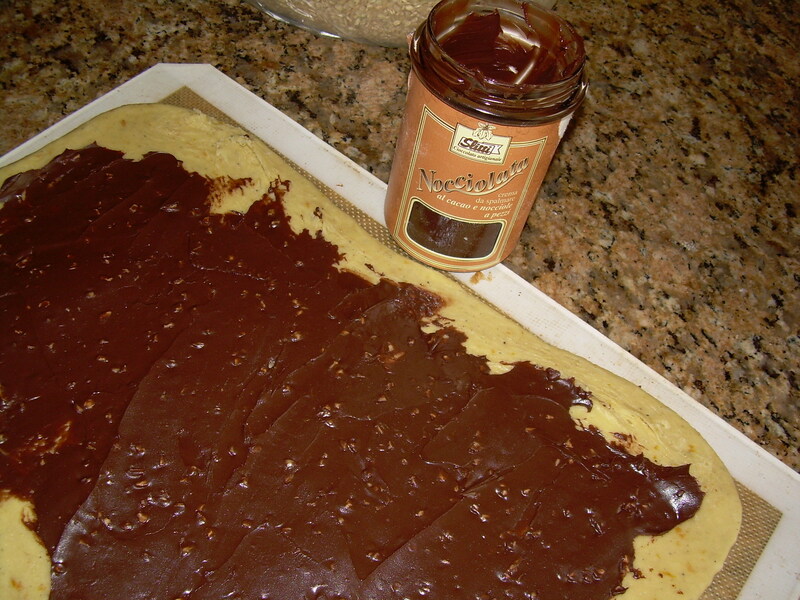 ), but want to try a higher-end version, consider giving Slitti’s Nocciolata a try. I bought some a couple years ago and have been hoarding it. 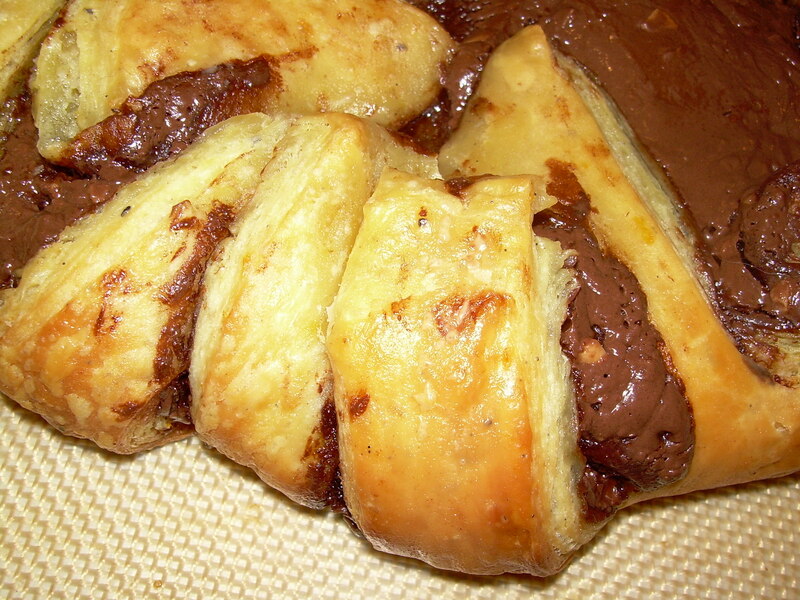 This year, while counting my blessings, I realized that this is the kind of stuff that needs to be used, so I recently made a Danish pastry braid, and filled it with this lovely chocolate nut paste. I revisited the Danish dough by Sherry Yard from a Daring Bakers Challenge earlier this year, and it worked out wonderfully. My braid that time turned out looking a lot better than my braid this time, but I attribute that to the usual harried mental state that so often accompanies Christmas and New Year’s at my house. The one thing you should leave out of the dough recipe is the cardamom; while the orange goes wonderfully with the Nocciolata, the cardamom clashes a bit. Happy New Year, everyone, and may 2009 bring you health, wealth, and happiness, and the time to enjoy them all! 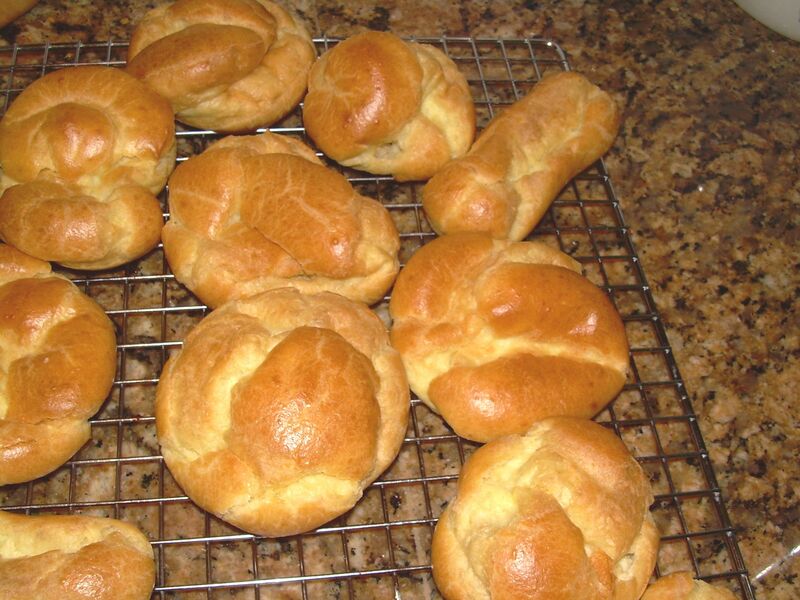 To see what other bakers have been making with yeast, check out Susan’s Yeastspotting every Friday for her roundup! 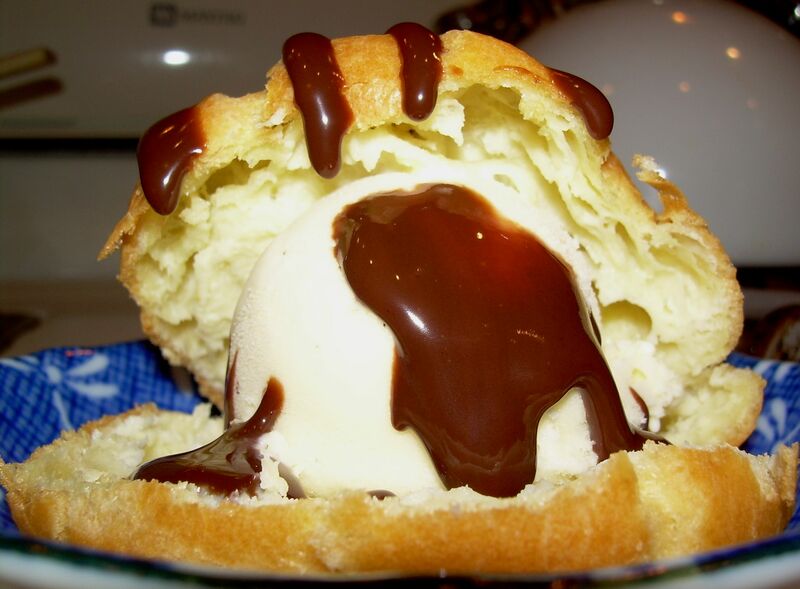 Sugar High Friday – Eggnog Ice Cream Profiteroles. 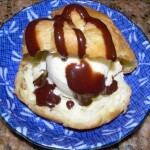 Oh, with Chocolate Sauce! I’ve only participated in Sugar High Friday one other time, and they forgot to list me, much to my dismay. Really, though, my main problem with participating every month has not been hurt feelings (imagine the poor blogger who hosts, trying to keep all these entries straight – stuff happens! ), but rather trying to find out exactly WHO is hosting in time to actually make something and post. I tell you, it ain’t always easy. This month, however, I lucked out, because the wonderful Anita of Dessert First is our hostess, and I read her blog all the time. Her theme? Spice! In this case, necessity was the mother of invention: I had a pint of cream that I needed to use up, and fast. I also happened to have my ice cream maker’s container stashed in the freezer, and I needed some room for other things. So I rolled up my sleeves and got to work. I took a basic ice cream recipe, and added some nutmeg and a shot of rum, plus TWO vanilla beans that were pretty shriveled, but which revived nicely in the cream. 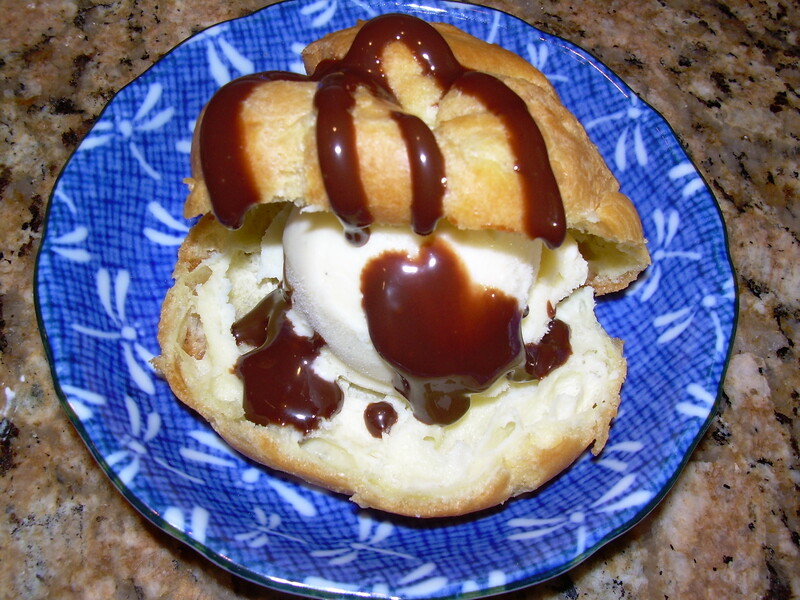 Then I stuffed some homemade profiteroles with the ice cream, drizzled it with Trader Joe’s chocolate sauce and proceeded to inhaled one of these. I showed remarkable restraint, I must say. The next day, I had another. I think my mouth experienced nirvana. There are some good commercial ice creams out there, but NOTHING beats homemade! Be sure to head back over to Dessert First on October 31 for Anita’s roundup of this month’s participants. 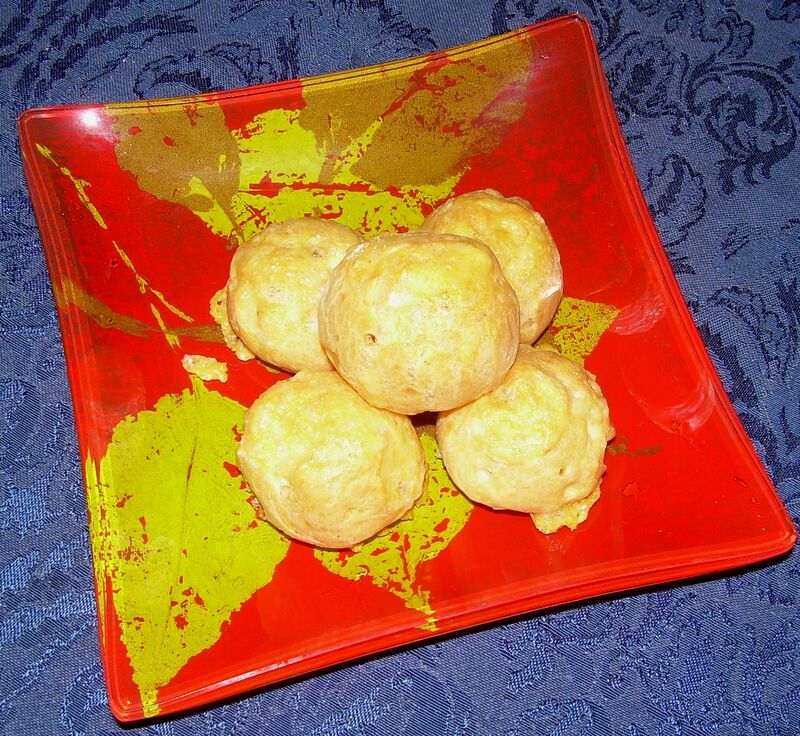 Recipe after the jump . . . .
continue reading "Sugar High Friday – Eggnog Ice Cream Profiteroles. Oh, with Chocolate Sauce!" I was thrilled when Meeta and Tony picked Pierre Herme’s chocolate eclairs for the lastest Daring Baker’s challenge (you can find the recipe on their blogs, or in his book Chocolate Desserts by Pierre Herme .) 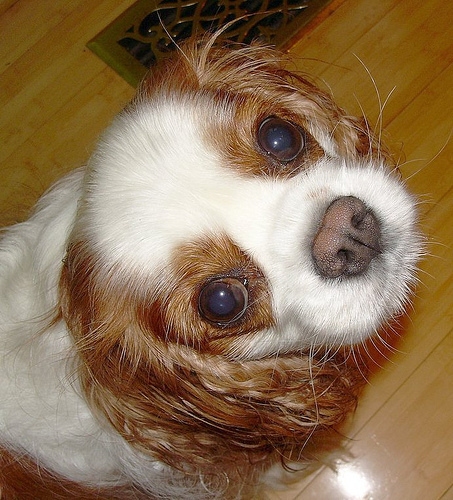 I have been out of town, and have just found the time to get this post up today – please pardon the photos, too, as I’ve been so busy, that staging has been far down on my list of priorities! 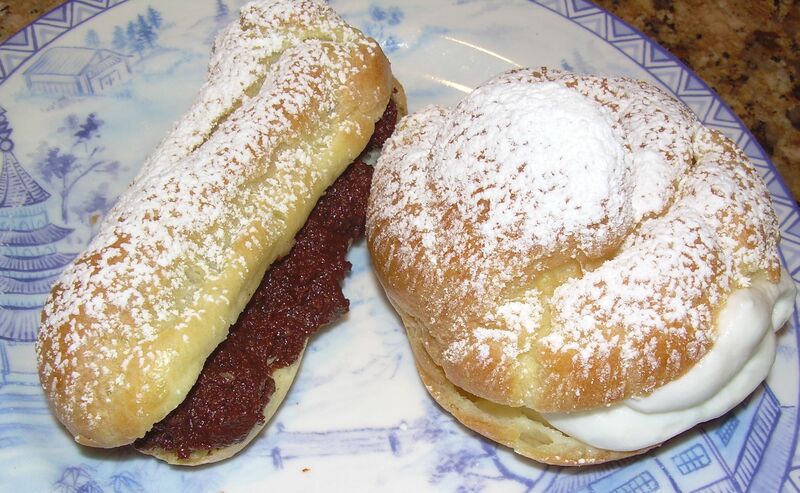 I didn’t have any problem making the pate a choux, but I did have to bake them for about 30 minutes, instead of the 20 minutes stated in the recipe. 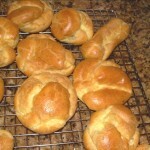 When I pulled them out of the oven, I cut a small slit in the side of the puffs to help steam escape. I decided to make Pierre Herme’s chocolate pastry cream, which tasted great but was sadly lacking in the texture department. I don’t blame Pierre, though, just my technique. Because we had the option of using either the chocolate pastry cream or a chocolate glaze, I went with the pastry cream and a light dusting of powdered sugar. 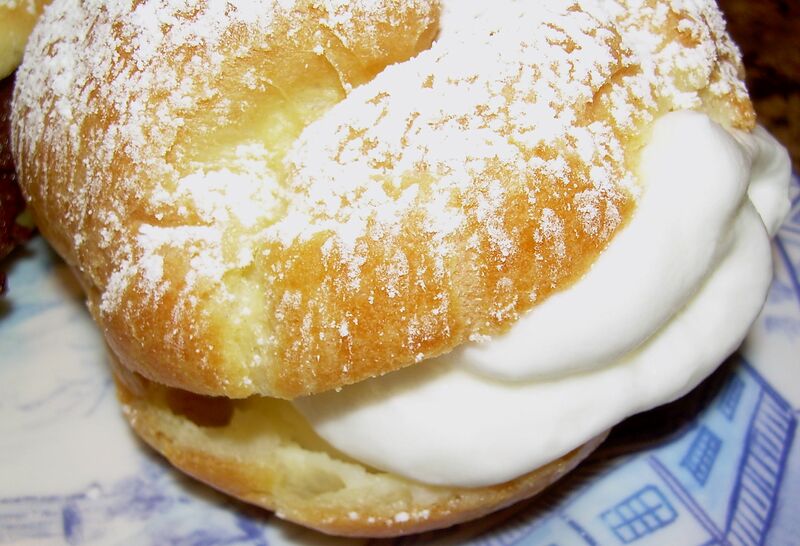 I also decided to fill a few of the shells with whipped cream, and those were very tasty, too. My favorite part of the whole thing? The empty choux shells! I could eat those with nothing in them, I thought they were that good! The eggy flavor that some bakers discuss did not bother me one bit in this recipe, so it’s something that I plan to make again. Perhaps a filling of homemade vanilla ice cream? Drizzled in fudge sauce? Definitely something to think about. To see what the more than 1000 Daring Bakers have been up to, be sure to check out the blogroll. Yes, passionfruit, again. I love the stuff! This month’s selection came to us courtesy of Kelly of Sass and Veracity and Ben of What’s Cookin’?, who chose Danish Pastry from Sherry Yard’s fantastic book, The Secrets of Baking: Simple Techniques for Sophisticated Desserts . Be sure to check out their blogs for the recipe, as well as the Daring Bakers Blogroll for links to the creations of over 700 bakers, worldwide. I love Danish pastry, but I never eat it. Why? Because, because . . . . Now, what is the word I’m searching for? Ah, yes, because most of it in America is cr*p. That’s the word! It’s not worth the calories. They don’t use enough butter, if they use real butter at all. So when Ben and Kelly chose Danish pastry as this month’s challenge, I was overjoyed. I like working with pastry, but my one concern was the weather. You see folks, in the mid-Atlantic region of the U.S., we have entered the time of year where heat + humidity = poor pastry baking conditions. As you can see, there’s hardly anything in there. I plan to use that technique again. 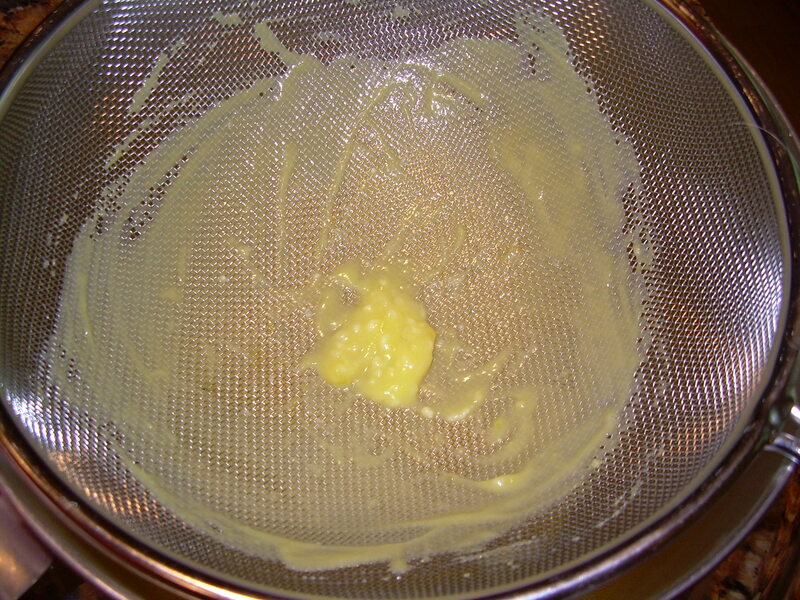 For another passionfruit curd recipe, see here. 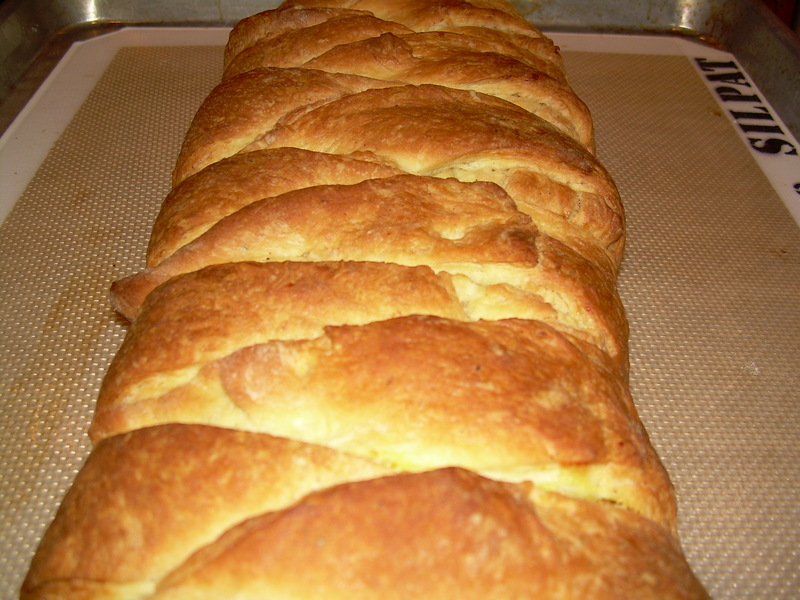 After using 2 eggs in the dough, and 7 for the curd, I decided not to paint the egg wash on the braid before baking. I figured 9 eggs was enough. 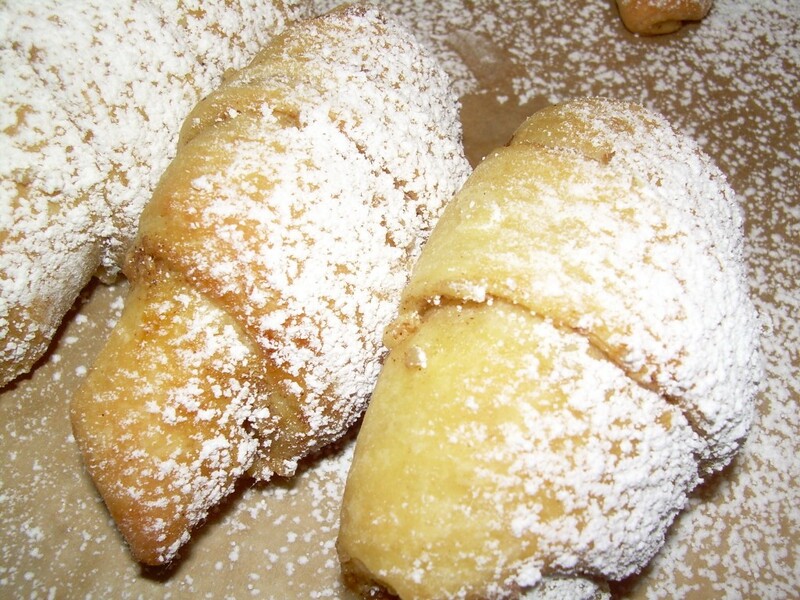 The pastry was flavorful and flaky, and the flavor improved as it sat. I really liked the filling, but it could have used some cream cheese or pastry cream, I think. What’s a few hundred more calories among friends? Will I make this again? Yes! I’ve been wanting to make this for years, and the Daring Bakers finally gave me the incentive to do so. It’s not hard, but it is time-consuming, and you need to be patient as you roll things out. In the fall, I think I will try it with the apple filling in Yard’s book, or maybe with some pears? The possibilities are endless! I’ve been pretty busy, but decided to jump into Bread Baking Day for the first time by making a delicious cheese kuchen from Carol Walter’s wonderful book, Great Coffee Cakes, Sticky Buns, Muffins & More: 200 Anytime Treats and Special Sweets for Morning to Midnight. Bread Baking Day #10’s topic is Breakfast Breads, an excellent choice by Melissa of Baking A Sweet Life. 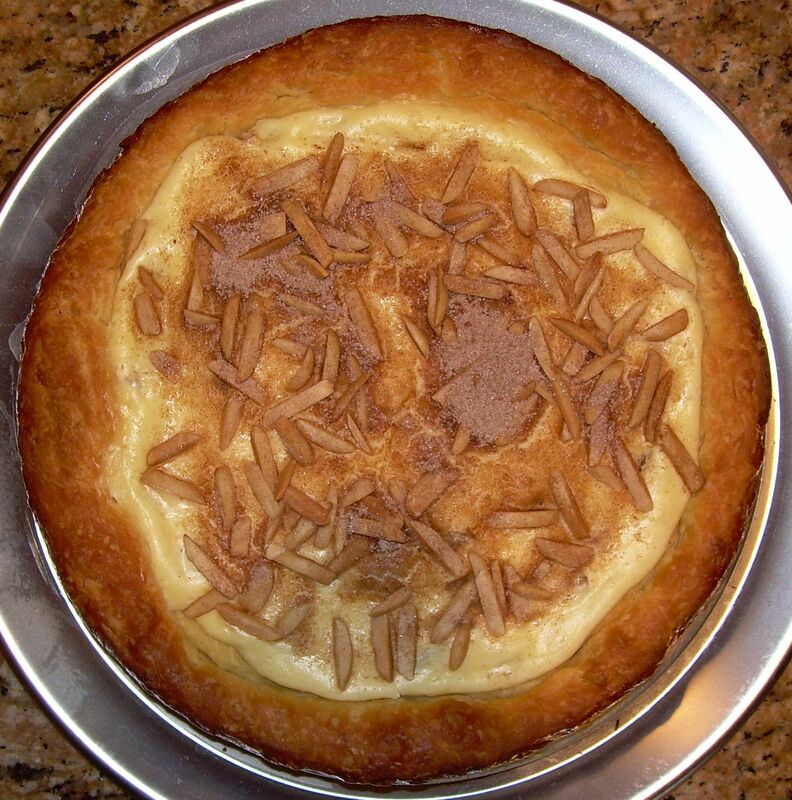 One of the recipes in Ms. Walter’s book yields a versatile sweet dough that you can make with either cream cheese or sour cream, and then you can use the dough for a variety of other yummy baked goods, such as crumb buns, sticky buns, or the cheese kuchen. 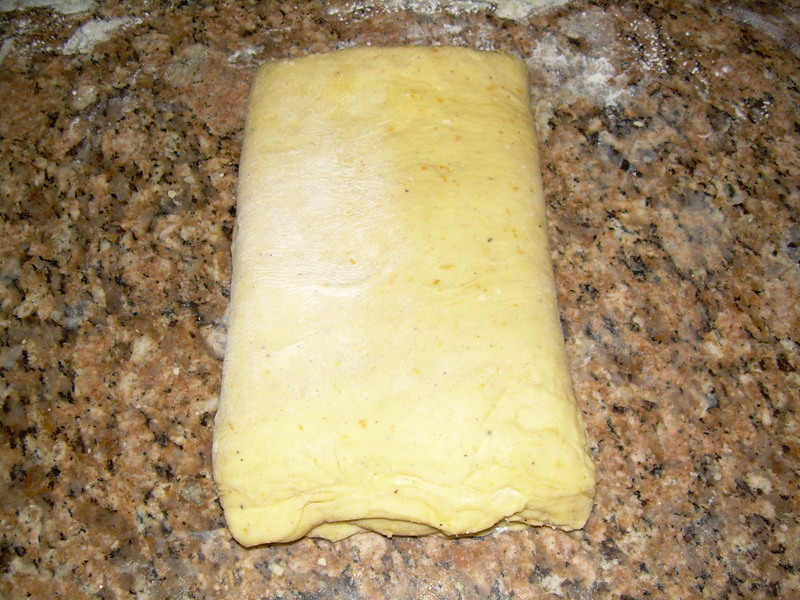 The dough is easy to make, easy to work with, and it freezes well. If you’re as busy as I am, that is an unbeatable combination. 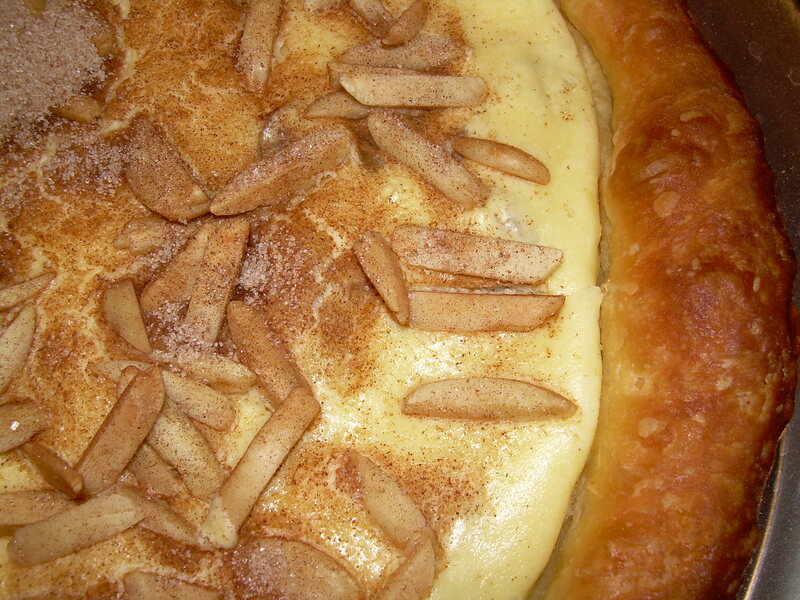 And, of course, the kuchen also tastes very good: it tasted like Danish pastry, but without all the work! The cheese filling was phenomenal, even with the raisins, which I usually don’t care for, but loved in this. In fact, I had to restrain myself from eating the filling with a spoon. I will be using this dough a lot! Keep reading more after the jump . . . .